If the man who averted war in the tinderbox that is the Middle East was not given the Nobel Peace Prize you’d think the jury was rigged. And you would be right because Russian President Vladimir Putin was a shoo-in for this year’s award. A delusion many people harbour is the Nobel awards are fair. People who believe in the impartiality of the Nobel judges probably believe in Santa Claus and the Tooth Fairy too. The cold fact is these awards are highly politicised. Sceptical? Don’t be. For, the Nobel judges can sometimes give a match fixing bookie a run for his money. Here’s a short list of people that even a blind judge could not have missed: Mohandas Gandhi (rejected all forms of violence), Dmitri Mendeleyev (the Russian scientist famous for the Periodic Table), Leo Tolstoy (perhaps the greatest novelist of all time; also rejected violence) U Thant (played a key role in defusing the 1962 Cuban Missile Crisis) and Anton Chekhov (one of the world’s greatest writers). But the peddlers of the prize gave them all a wide berth. Now here’s a short list of people and organisations that should not even have made the shortlist: American diplomat Henry Kissinger, US Presidents Barack Obama and Theodore Roosevelt, the European Union, and weapons designer Linus Pauling. Gandhi’s non-violence was described as a miracle that tamed even the easily-provoked Pathans of the Khyber Pass, and yet the Nobel Prize was denied to him. Many people of British origin living in different parts of the world owe their existence to Gandhi because he stopped the Indian revolutionaries from carrying out a general massacre of their forefathers – the 100,000-odd British soldiers, bureaucrats and civilians ruling India. Despite the fact that the British were indulging in mass massacres in India, the Norwegians – who award the Nobel Peace Prize – did not want to ruffle any feathers in Britain by honouring Gandhi. On the contrary, Norway had no problems awarding the Peace Prize to Henry Kissinger in 1973. Kissinger, the US Secretary of State, and President Richard Nixon were responsible for the use of chemical weapons in Vietnam, Laos and Cambodia and the massive bombing campaigns in Cambodia. American satirist Tom Lehrer said the award ‘‘made political satire obsolete’’. Also, just two years earlier Kissinger had winked at Pakistan’s massacre of three million of its own Bengali citizens. He had called the Indians “bastards” for stopping the genocide. The Norwegians were red faced when North Vietnam’s Le Duc Tho, who was jointly awarded the prize, declined it, saying peace in Vietnam was a big lie. Kissinger had no such scruples and accepted the prize “with humility”. This year the prize could have easily gone to Putin who had doggedly pursued peace while the Americans, their NATO allies and Gulf vassals wanted to bomb Syria into the Stone Age. Think about it, besides a terrible loss of life and the very real chance of sucking in everybody into an Arabian Armageddon, a Syrian war would also have sent the world economy into a tailspin. Putin’s diplomacy stopped the dogs of war. But the Norwegians handed the award to the Organization for the Prohibition of Chemical Weapons (OPCW). Now here’s a triple irony: one, OPCW would not be in the picture without Putin’s intervention; two, the chemical weapons watchdog got the award before Syria’s chemical weapons were eliminated; finally, OPCW would not have been awarded the prize if the rebel terrorists – or possibly their controllers – hadn’t used chemical weapons in the first place. Obama wasn’t the first American president with a penchant for war to be honoured by the Nobel Academy. Irwin Abrams writes in the book The Nobel Peace Prize and the Laureates that Theodore Roosevelt ‘‘showed his determination to see the United States as a great power using military force, primarily in the Caribbean, and this even in the year he became a Nobel Laureate. Many American newspapers found the award curious, and The New York Times later commented that “a broad smile illuminated the face of the globe when the prize was awarded ... to the most warlike citizen of these United States’’. A special place in hell is reserved for Cordell Hull. The American, who received the Nobel Peace Prize in 1945 for his role in establishing the United Nations, was directly responsible for condemning hundreds of Jews to the Holocaust. In what is known as the St Louis crisis, in June 1939, Hull threatened to withdraw support to Franklin Roosevelt if the ship SS St Louis, carrying 950 Jews fleeing Nazi Germany, was allowed to dock in an American port. Hull and the Southern Christians forced the Jews to return to Europe, where the Germans gleefully desptached more than a quarter of them to the gas chambers. According to the Swedish newspaper Dagens Nyheter the Nobel academy prefers to pick European authors. ‘‘Since 1995, 85 per cent of the winners have been Europeans,’’ it said in a 2008 article. In the nine years starting 1999 the Nobel Academy appointed seven European winners and only two from outside Europe. Also, Sweden’s historic antipathy towards Russia has been cited as the reason neither Tolstoy nor Chekhov got the prize. The Nobel judges aren’t above bribery and corruption either. In 2008 Harald zur Hausen bagged the Nobel Prize for Medicine for discovering that HPV causes cervical cancer. But even as he was basking in his newfound glory, the Swede was being investigated by his country’s police. It emerged that AstraZeneca, a pharmaceuticals company with stakes in HPV vaccines, had very close links with key members of the selection committee. Further investigations revealed that AstraZeneca was also sponsoring the Nobel website. In the peace prize, for instance, a deciding factor is Norway’s geopolitical tilt. As a NATO member, Norway reflects the prejudices that are inevitable because of the country’s entanglement in military politics. Giving the 2013 prize to Putin, therefore, would have been a painful act for Oslo. To be sure, all awards have an element of bias. Take India’s Padma awards, where diehard sycophants walk away with the top honours. The worst case was in 2010 when the surgeon who performed a bypass on Prime Minister Manmohan Singh made the cut while the scientists and engineers behind India’s spectacularly successful moon mission were ignored. In the backdrop of the power shift from the West to the East, a new set of awards – perhaps a BRICS Prize —wouldn’t be such a bad idea. 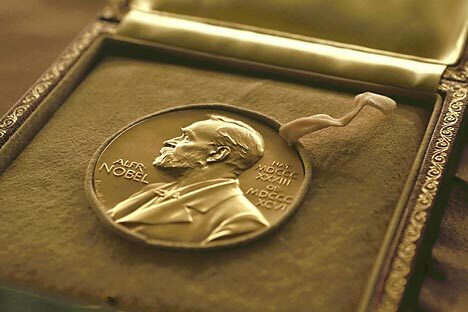 Surely, it’s time to move away from the Nobel Prize which rests on the foundations of war – the legacy of Alfred Nobel, an ammunition magnate and the inventor of dynamite.